The St. Louis Cardinals baseball franchise was founded in 1882 as the St. Louis Brown Stockings. The following year, they shortened their nickname to the Browns until 1899, when they spent one season calling themselves the Perfectos (though their 5th place finish was far from perfect). Starting in 1900, the name Cardinals was adopted as a result of a female fan commenting on the uniforms being “a lovely shade of cardinal.” The uniforms did look good; unfortunately, the team didn’t. For the next quarter century, and despite legendary Hall of Famer Rogers Hornsby winning six consecutive batting titles, the Cardinals could muster no better than a 3rd place finish. But just as Babe Ruth did in New York, a player came to town in St. Louis and helped build a National League version of a Yankees dynasty. That was Jim Bottomley. Now, the tale of Jim Bottomley may not be as distressed as that of “The Bambino” but his childhood in the town of Nokomis, Illinois was anything but easy. As with many other children during World War I, Bottomley dropped out of high school at the age of 16 to help raise money for his family. He took jobs as a truck driver, grocery clerk, railroad clerk, and at one point, coal miner, an occupation that took his brother, Ralph’s life in an accident in 1920. He earned the nickname “Sunny Jim” for his unwavering optimism in the face of all his hardship and uncertainty, always offering a light-hearted smile and a word of encouragement. Bottomley’s luck started to turn when he signed on with a semi-pro baseball team to extra money and caught the eye of a police officer who knew Cardinals General Manager Branch Rickey. Soon after, Bottomley was offered a tryout and signed a minor league contract with the Cardinals. Two years later, he was making his debut in St. Louis. While Jim Bottomley turned out to be a major “find” for the organization, he was but the first, resulting from what would become a standard practice that would advance the winning culture Hornsby and Bottomley were building in St. Louis. With Branch Rickey taking the reins as business manager in 1920, he expanded scouting, player development, and pioneered the minor league farm system. Marty Marion, Enos Slaughter, Stan Musial and Red Schoendienst were just some of the great players produced through the Cards’ farm system that kept the team on a winning path for decades to come. Though Rogers Hornsby was considered one of the top players in baseball, having won the National League Triple Crown in 1922 and 1925, the Cardinals were never serious contenders for the pennant. That changed in 1926 when the Cardinals fielded a lineup with seven of the eight starters batting .290 or better and Jim Bottomley leading the team in home runs and RBI. With some bookmakers installing the mighty New York Yankees as high as a 15-1 favorite, the Cardinals came back from down 3 games to 2 to sweep the final two games in New York and claim their first title. Two years later, the Cards returned to the World Series behind Bottomley’s NL MVP season, leading the league in triples (20), homers (31) and RBI (136) while posting a .325 batting average. This time it was the Yankees that were victorious, but St. Louis would return to the World Series in 1930 and 1931, losing the first to the Philadelphia Athletics while taking the crown the next season in a rematch. Bottomley was traded to the Cincinnati Reds in 1932 but the culture of winning stuck with the Redbirds, making five more World Series appearances (winning four of them) from 1934-1946. A quarter century with no championship appearances was followed by four in just a six-year span, with Jim Bottomley and the St. Louis Cardinals beginning a run that includes 19 NL pennants and 11 World Series championships for the history of the franchise. He was elected to the Baseball Hall of Fame posthumously in 1974 by the Veterans Committee. Jim Bottomley passed away in 1959 and, having had no children, all of his personal items were left to his wife, Betty. Betty remarried in 1972 to J. J. Tucker, a friend of and pallbearer to Jim who had a daughter from a previous marriage. Upon Betty’s passing in 1977, three years after Jim’s induction into the baseball Hall of Fame, the Bottomley estate was inherited by Tucker, who then left the items to his daughter upon his passing. These items were then acquired from the daughter of J. J. Tucker and consigned to MHCC. Leading the list of 85 Jim Bottomley items in the June auction is his 1926 World Series game-used bat, an H117 model Hillerich & Bradsby gamer that is un-cracked yet exhibits plenty of game and is graded a conclusive GU 10 by PSA/DNA. Also featured is Bottomley’s 1931 World Series championship ring, which he left in the care of his wife after losing his ’26 championship ring while pheasant hunting. Other key pieces include a game-used Rawlings profession model JB glove that shows evidence of extensive use with heavy game wear in the pocket as well as the reverse side, and authenticated by PSA/DNA. 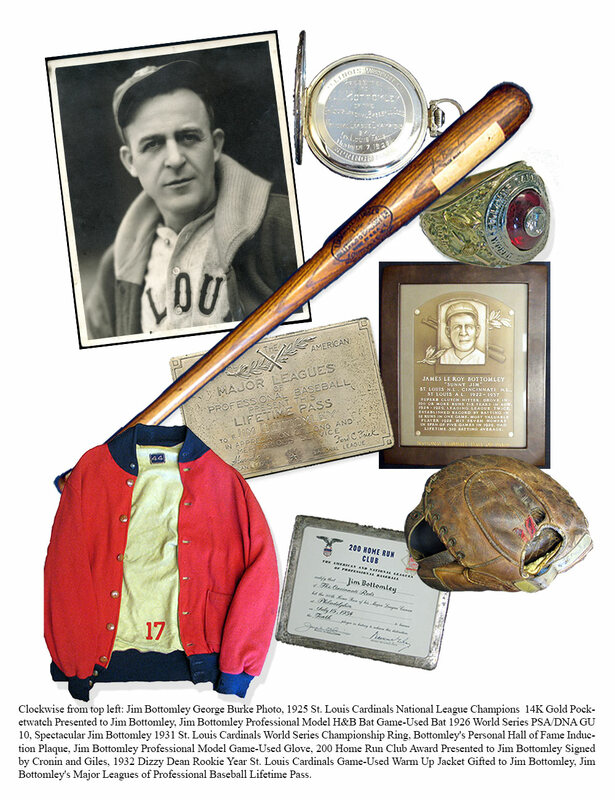 Other key items include his Hall of Fame Induction Plaque, a one of a kind piece specially made for the inductee, Bottomley’s Major League Lifetime Silver pass and 200 Home Run Club Award Presented to Jim Bottomley Signed by Cronin and Giles. More personal items include Bottomley’s Engraved Lighter with Wrapped Cigar and Diamond Matchbooks, Personal Shaving Kit, Engraved Doorknocker, Selective Service System Certificate of Appreciation, A.A.S.R. Freemasonry Certificate From 1929, Birth Certificate with Certified Copy of Wife Betty’s Birth Certificate, Official Marriage Certificate, Ceremonial Marriage Certificate, Pair of Cowbells Belonging to Jim Bottomley’s Cow “Fielder’s Choice”, many never before seen photos of Bottomley and a 1932 Dizzy Dean Rookie Year St. Louis Cardinals Game-Used Warm Up Jacket Gifted to Jim Bottomley. Autograph seekers will be impressed with the array of unique, signed items that include a Jim Bottomley Signed and Cancelled Bank Check, Signed 1934 ANSAR Temple Shriner’s Membership Card, Personal Signed and Inscribed Bible, Signed Bank Deposit Slip, Jim Bottomley Oil Company Ledger Written in his Hand and a 1954 St. Louis Cardinals Season Pass Extended to and Signed by Jim Bottomley.